Westbound Interstate 10 closed between 51st and 67th avenues in west Phoenix from 10 p.m. Friday to 6 p.m. Saturday (April 20) for bridge construction at the Loop 202 South Mountain Freeway interchange. Westbound I-10 on-ramps at 27th, 35th and 43rd avenues also closed. DETOUR: Expect heavy traffic and consider alternate routes, including westbound and southbound Loop 101 west of I-17. Westbound I-10 traffic exiting at 51st Avenue can detour along local routes, including westbound McDowell Road. Eastbound Interstate 10 closed between 67th and 51st avenuesin west Phoenix from 6 p.m. Saturday to 3 p.m. Sunday (April 21) for bridge construction at the Loop 202 South Mountain Freeway interchange. Eastbound I-10 on-ramps at 91st, 83rd, 79th and 75th avenues also closed. DETOUR: Expect heavy traffic and consider alternate routes, including northbound and eastbound Loop 101 in the West Valley. Eastbound I-10 traffic exiting at 67th Avenue can detour along local routes, including eastbound McDowell Road. NOTE: Eastbound I-10 drivers planning to travel beyond the Phoenix area can consider exiting to southbound State Route 85 in Buckeye and then using eastbound I-8 to reach I-10 in the Casa Grande area. Southbound Interstate 17 closed between 19th Avenue/Durango Street and the I-10 “Split” interchangenear Phoenix Sky Harbor International Airport from 10 p.m. Friday to 5 a.m. Monday (April 22) for pavement improvements. Both I-10 ramps to southbound I-17 at the “Stack” interchange south of McDowell Road closed. DETOUR: Southbound I-17 drivers, including those traveling to Sky Harbor Airport, should consider alternate routes such as eastbound I-10 in the downtown Phoenix area. Expect delays if exiting southbound I-17 at 19th Avenue. Traffic there can detour on southbound 19th Avenue to eastbound Broadway Road and northbound 24th Street to reach I-10. Project schedules are subject to change due to inclement weather or other factors. 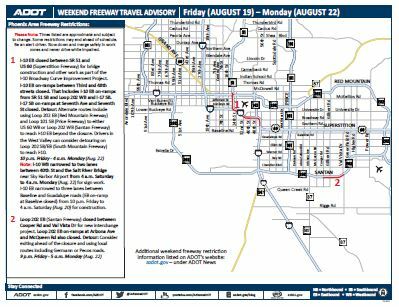 Additional freeway restrictions such as ramp or frontage road closures will be posted at azdot.gov, under ADOT News. Visit the site to also subscribe to ADOT email and text updates, including future weekend restriction information. Another great way to find more about ADOT’s projects and programs to improve Arizona’s transportation system is the ADOT Blog at azdot.gov/blog. ADOT plans and constructs new freeways, additional lanes and other improvements as part of the Regional Transportation Plan for the Maricopa County region. The primary funding source for regional freeway improvements is a half-cent sales tax approved by county voters in 2004. More information about ADOT projects and the regional plan is available at azdot.gov/projects.